Have you ever had the burning desire to photograph and have it be so strong that it consumed you, blinded you to everything else and even paralyzed your ability to act because the urge to merge with the landscape with lens and light was so paramount in your mind and body that it controlled and intimidated your very being? No? Well, ok. I have and often do and was under that influence on this day. I’d driven down an eroded sand road on Cedar Mesa to a point of land overlooking a string of deep side canyons with the intent of walking their rim and finding a few archaeological sites to photograph. No such luck. The sandstone shelves were bare. I felt this strong need to consume my time with photography, to actually make one image that moved me. The previous days’ long hikes had left my legs tired. I was slothful. A secondary, likely woodcutting road, led further out to the point than I’d stopped. I followed it driving and walked to the far point of land overlooking Valley of the Gods. It was Memorial Day, 3 pm and the sky was clear and blue. Not exactly prime conditions for quality landscape photography. I was an image-addict in need of a fix. I made a few iPhone remembrance shots and feeling unfulfilled dragged myself into my truck to drive home. I drove slowly over rocky sandstone outcrops. My visual and mental search for sites had blinded me to the bloom taking place. Claret cup and prickly pear cacti. Ricegrass. Peppergrass. Blue lupine, penstemon, scarlet gilia, paintbrush and several versions of yellow sunflowers were all showing their colors. 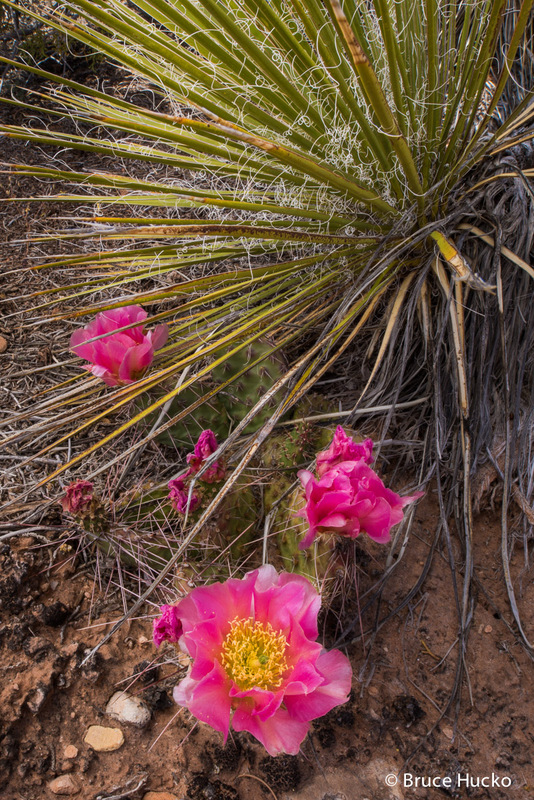 I stopped, gathered equipment and followed the voice inside me saying, “photograph desert flowers,” and began to collect cactus blossom images. One amongst spines. Three amongst spines. I’d seen these compositions before, and not by me. I stopped. A breeze had come up making photography of the slender dancing flowers difficult. Out came my flash, extension cable and a switch to rear-curtain sync. After that rather furious and fruitless session I drove again and was stopped by a few prickly pear blossoms nestled under a small narrow leaf yucca with its strong radiating lines. I like contrast like this – still flower, dynamic lines. Soft petal, sharp spines. I’d added my large, 48-inch, collapsible diffusion reflector to my gear. It was leaned over my little scene making the light even and luminous. The breeze blew it off. As I reached for it from my stooped position I turned my back towards the yucca so I wouldn’t puncture myself on its sharp ends. 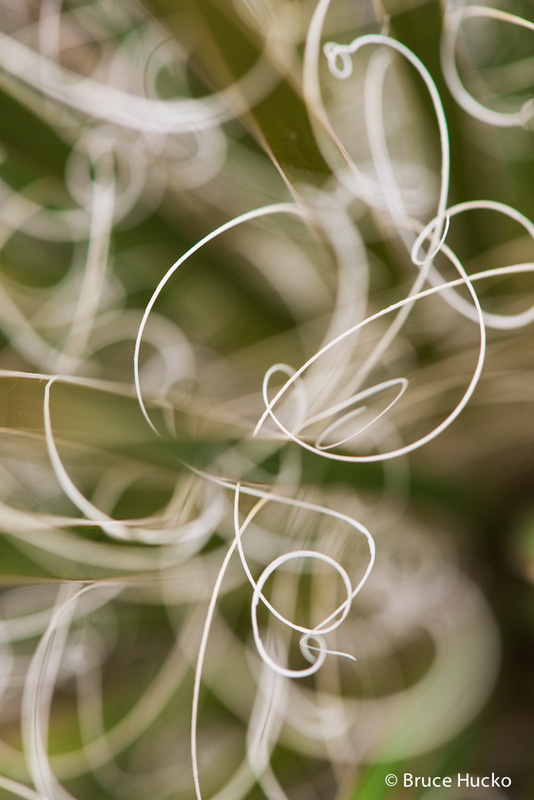 Turning back to work my unfocused gaze was shaken as I peered into the yucca and the random pattern of hair thin filaments that curled and curved away. I was startled and then transfixed. Here! Here was todays dance in the desert. 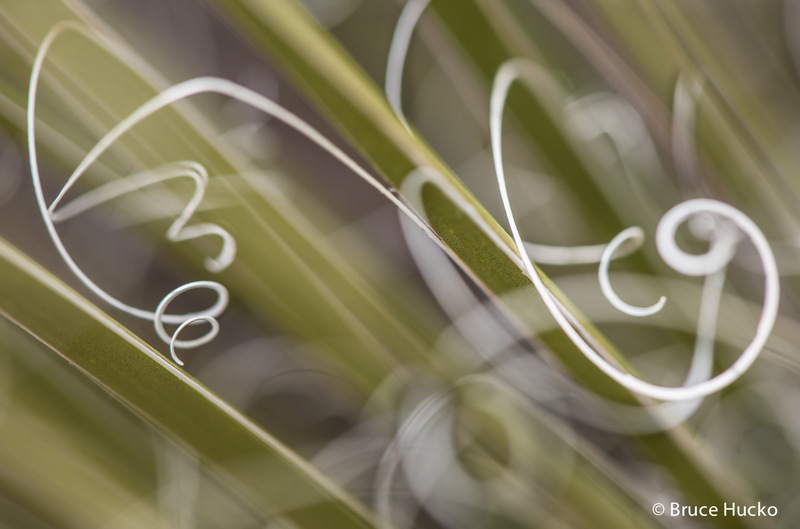 Each spear had dozens of these delicate spirals attached to it. I was lured in by their movement. Time for the 105 macro! For the next 2 hours or more I gloried in making a few images deep in the yucca. Georgia O’Keeffe said, “I paint the inner world of flowers, color and light, and paint them large so people cannot ignore their beauty.” I was going into this world as I had not done before. As I peered into the viewfinder and changed focus ever so slightly I felt like a one-person audience at a great modern dance. Even the slightest shift brought new dancers to the front of the stage. It took quite a while to make the first good images as small camera and tripod adjustments made major changes in my general composition. I was glad for the extension arm I’d brought as it allowed me to swing and angle the camera to more workable positions. I do little macro work and so don’t own a focusing bar, but I certainly understand their worth now. The first photo left me almost breathless and I stood slowly to relieve the tightness in my knee and ankle joints. Whew! I thought about moving on – but where? I admonished myself. It’s happening right here. Right now. Yep! So I better prepare. I collected my sleeping pad, snacks and water bottle out of my truck, tethered my diffuser and gathered my camera bag close by so I would but reach for what I needed. I’d formed a little creative cluster of comfort and equipment. I then sat on the pad, pulled the reflector into place so I and the yucca were shaded and stilled myself by openly gazing into the plant. I’d single out one particular curling filament, consider its movement, squint at it to get the out-of-focus feel, and alter my angle by leaning slightly side-to-side. I did this for about 20 minutes until I felt I was in that world and knew what I was responding to. At the forefront of my perception were the delicate gestures that each filament made. Curl up. Curl down. Embrace another. Spiral away. I would isolate and position it in my frame while all the while considering all the out-of-focus movement behind and in front of the principal dancer. In macro, objects between the lens and the main object area as important as those behind the subject. There was a growing breeze and an oncoming cumulous system. ISO went to 400 from 100. Aperture in this situation is of great importance as the amount of content in focus can make or break the image. Too little and your primary subject is not well defined. Too much and you may have visual chaos and not be able to determine subject from content. Just right and the subject moves and connects to the rest of the frame in a most pleasing way. All 3 of my “keepers” were at f8. I don’t think I’ve ever spent so much time concentrating on such a small portion of land. My subject was not even a whole plant, but a small portion of the deep and marvelous world within! Feeling finished I leaned back, stretched out on the ground and felt quite relaxed, refreshed and content. A good session within the glass will do that. At home adding contrast and clarity, reducing highlights and making a slight color adjustment in Lightroom returned me to the essence of the experience. These were a new kind of image for me and I remain thrilled! My ‘idee fixe’ of stone structures had nearly blinded me. Let go of photo intentions. Allow images to find you. Posted in Personal Reflections, Tools & Technique on October 21, 2016 by Bruce Hucko. This was wonderful, Bruce. I resonated with how you were drawn in at the end, and how you were re-learning the lessons of letting the images find you. We ALL go down the path with a fixed idea, a plan, and while sometimes, that is a good thing, we must all be open to whatever is a long the way, whatever is wanting to happen, so that we can see past our fixed ideas. Brenda. Thanks so much for the note on Yucca Dreams. My blog requires that I “approve” comments. I wish there was a way to tell it to “approve Brenda without question” cause I would.